Remember that water stop you so desperately needed to make it through the last mile? Or the turn arrow that kept you on course? More than likely, you have John Bornhorst to thank for that. 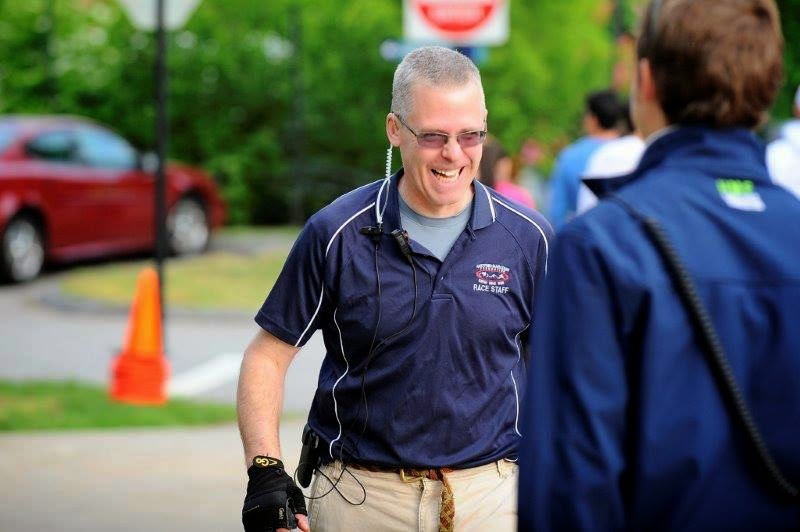 As part of the HMF race operations team, John is one of the valuable staffers that help make it all work on race day. Learn a little more about him, and say hi next time you catch him on race day! Operations support, setting up every tent, sign, piece of fencing, water stops, mile markers, turn arrows, all the pieces that go together to make a race great. Started volunteering in the fall of 2007 and became part of the staff in the spring of 2010. This year, I’m finally getting back on the road after a few years off thanks to the HMF 5K training group getting me up and running on Saturday mornings! Slow and steady is my style, not a fast runner but love the feeling of getting in a good 5-6 miles to sweat the world away. Besides the Hartford Marathon, I love the different scramble races we run during the summer. It’s great to see everyone come out after work, have fun with a theme, and get to enjoy good music, food and a cold beer along the Riverfront. Working the race for Sandy Hook was a memorable day. It was great to see 15,000 runners together for such a good cause. The weather, if it’s not the cold or too there is always the wind. But we always seem to make it work and overall we’ve been really lucky the last few years. Listening to Lt. Kevin McCarthy sing the national anthem at many of our events. He has an amazing voice. There is a lot of organized chaos. Like most runners, I have been sidelined by injury and frustrated while waiting it out to heal. Over the years, I’ve learned from many credible and talented partners of ours that healthy training and post-injury care are critical to staying on my feet. We want to give you direct access to ask your injury-prevention and recovery questions to one such valued partner, Physical Therapy & Sports Medicine Centers (PTSMC). We’re excited to be joined in our #askHMF Twitter Q&A series this Friday by Kathryn Flodquist, PT, DPT, cert. MDT, CSCS. Kathryn is a Certified Strength and Conditioning Specialist with PTSMC and also a USA Triathlon Level 1 coach. 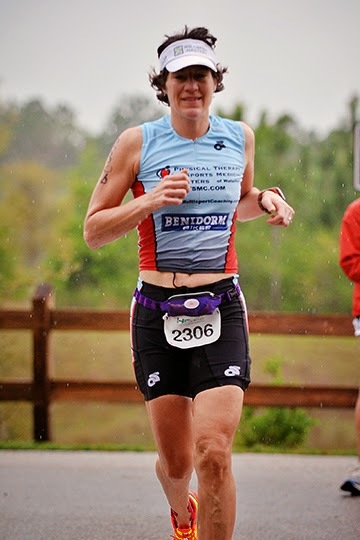 As a physical therapist and triathlete herself, Kathryn is well equipped to answer your questions on common injuries like Plantar Fasciatis, Achilles tendonitis and ITB syndrome/knee pain and can offer healthy training tips. Kathryn will join us from 1-2:00 pm on Friday, June 20, via @RunHMF, just send your questions to us using #askHMF. Learn more about Kathryn and PTSMC below, we look forward to hearing from you Friday! 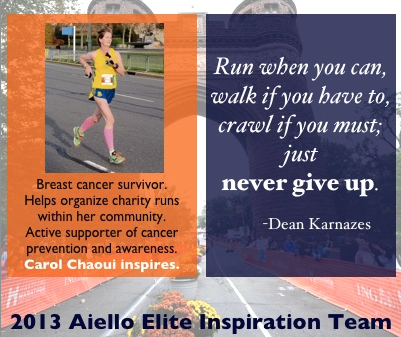 Apply for the 2014 Aiello Inspiration Team! Calling on inspirational and motivational athletes to submit an application to be part of this year’s Aiello Inspiration Team at the NU Hartford Marathon and Half Marathon. We love this tradition of giving well-deserved attention and great perks to athletes that make positive contributions to their communities or humbly serve as inspirations to others. Applications will be accepted from runners of any age or skill level participating in the October 11th NU Hartford Marathon and Half Marathon. Runners can nominate themselves or others who they feel represent inspiring qualities. We will provide Aiello Inspiration Team members with elite level benefits during race weekend including complimentary hotel stay, Pasta Supper tickets and marathon apparel. Additionally, they will receive an Elite Runner Package (value $80) including limited access parking adjacent to the start/finish line, Mail My Packet service to receive bib and shirt in late September, pre-race massage service and exclusive access to private portalets (a most coveted perk!) and secure private lockers to store personal items. Application forms are available on the NU Hartford Marathon and Half Marathon Registration Tab under Aiello Inspiration Team. Nominations will be accepted through June 30 and then a panel committee will review applications and winners will be notified in July. The first inspiration team was introduced in 2011. Aiello Home Services signed on to support the Aiello Inspiration Team last year to help recognize the many amazing personal journeys and experiences that compel runners to take part in Hartford Marathon Foundation events.